This topic contains 8 replies, has 6 voices, and was last updated by John Tansil 2 months, 3 weeks ago. It is with great excitement and gratitude to offer a new course at the 2019 MWA Whitewater Clinic. Dale Dortch, ACA Swiftwater Rescue instructor, and RJ Forth, ACA SWR Instructor Trainer, have offered to teach a clinic in Swift Water Rescue to our seasoned paddlers. 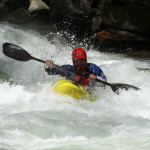 Dale and RJ are accepting applications to join this clinic from all paddlers who have advanced skills on whitewater. They require each paddler to bring and wear a full drysuit, thermal layers fit for the conditions of the weekend, a rescue PFD and whatever canoe or kayak they choose to paddle, outfitted with floatation. Class is limited to 15 people who will be interviewed to assess their skill level is appropriate for the curriculum. Day 1 will go until 5pm. Day 2 is planned to release around 2pm. Since many of our interested candidates are teaching this year and will want to teach in 2020 also, Dale and RJ are planning to offer this class, Swift Water Rescue, one week before the clinic in 2020 to our instructors who will be teaching the 2020 clinic. Plans are being made to include Instructor Trainer certification before the 2021 clinic also. Thank you, Dale and RJ for stepping up to offer our area the finest education in water safety. I talked with Dale about this before and he wasn’t sure. Would Mason be able to do this at 13? He has paddled up to 30″ on the Saint comfortably. I feel he really needs a swr coarse being more competent than many on the river with him at times. Mason may be a good paddler, but that doesn’t mean that you need to insult the rest of us! Lol, I don’t think you apply in that scenario. There’s always newbies and fair weather paddlers. I think Jerry and Chris should duke it out in the Boater Cross. Terry and I are in for sure. Do you have the contact info to who I should reach out to to save a 2 spots?